Unwind at the end of a long day on this two piece chaise sofa. Track arms and brushed stainless steel legs offer a contemporary feel to the piece, while loose pillow seat backs and thick foam seats provide your living room with inviting comfort. With hundreds of leather, fabric, and Ultrasuede® cover options available, you are sure to find the right fit for your home. The Breckin Contemporary Chaise Sofa with Track Arms by American Leather at AHFA in the area. Product availability may vary. Contact us for the most current availability on this product. 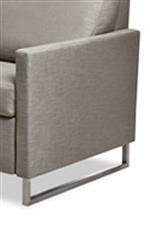 BKN-SO3-LA Left Arm Three Seat Sofa Section 1 72" 39" 37"
BKN-SCH-RA Right Arm Chaise Section 1 31" 66" 37"